There he goes: the new leader of the Nationalist Party, sworn in as a member of parliament on the back of a sucker’s decision to lie down and be a doormat for the party leader rather than the lawful representative of his constituents. 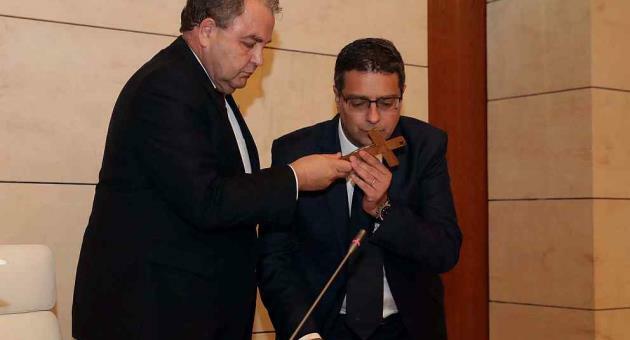 Delia is seen here kissing the crucifix held by another piece of work, the Speaker of the House, while he racks his brains over how to use his position to make enough money to pay the one million euros he owes in personal bank loans and other debts, while also raising enough to fund his lifestyle habits and those of his household. And nobody asks these questions or worries about them, because apparently it is considered a crime or bad taste to raise the alarm over the obvious impossibility of paying a million-euro personal debt and annual household bills that are easily treble your Opposition leader’s salary. Malta: the island where everybody craves money but nobody seems to understand exactly how it works.